Easily showcase two hanging adornments at once with the Esschert Design Double Shepherd Hook. Placing a double hook in your yard increases your display options, allowing you to create a versatile and fun birding station in moments. 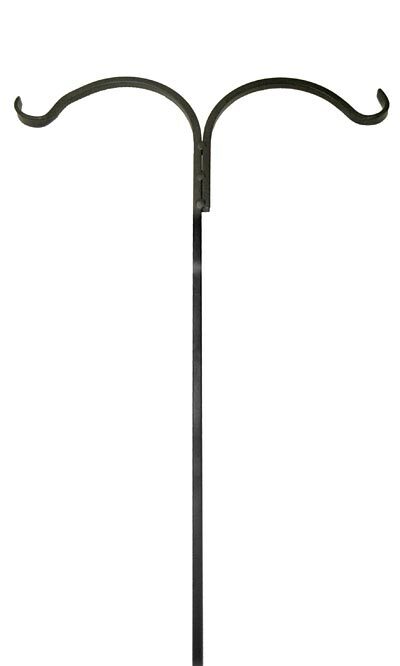 This hardy piece will certainly be a fantastic addition to your bird garden, thanks to its generous height, durable black finish, and square steel body. The center shaft reaches 7', and a 10" long, step-in base keeps the item stable in your soil. One hook extends 7.75" outward, while the other reaches 8" outward, and both culminate in a small curl. These arms are perfect for holding items up to 15" in diameter. Pointed ends at the bottom of the hanger make it simple to install in your yard, and the black finish throughout the piece remains lovely. Display two hanging items easily on this Double Shepherd Hook.